Pipes or Tobacco – What’s Your Passion? To dedicate or not to dedicate? That is a question that is asked frequently by pipe smokers. Before I give my answer to this question, I would like to explain a few things. There are some advantages to dedicating pipes to certain tobaccos and there can be some disadvantages as well. The reason why piper smokers wonder about this is; ghosting can and does occur while smoking pipes. A lot of pipe smokers wonder if the ghosting will affect the next blend that they smoke in the same pipe. Dedicating pipes to specific tobaccos mainly apply to briar pipes. Briar pipes have the most tendencies to ghost than other types of pipes. Ghosting is pretty easy to define and understand. It is when the flavor of a blend stays with the pipe after you have smoked it. It can and will affect the flavor and aroma of the next blend that is smoked in that same pipe. 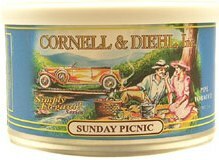 The tin aroma of this blend is a nice sweet and tangy smell with a light hint of spice to it. It smells really nice. The moisture content is perfect for smoking right away with no drying time needed. This tobacco is in flake form. I took a couple of flakes, rubbed them out, loaded my pipe, and proceeded to the charring light. The tin aroma of this blend is slightly sweet and very tangy with a hint of plums. There is also a note of, what I can only describe as, darkness to the blend. There is a very small amount of Latakia in it (I think that it is 2%) and you really have to search for the aroma of it. At first I didn’t pick it up, I had to keep smelling it and I finally picked up on a very, very faint hint of it. The tanginess of the aroma starts my mouth to watering and I love when a VA/Per blend does that. Greg Pease is the owner of G.L. Pease, Intl. Greg began blending pipe tobacco over 30 years ago and in 1998 left his regular job of 18 years to pursue tobacco blending full time. In early 2000, G.L. Pease Tobacco was born. G.L. 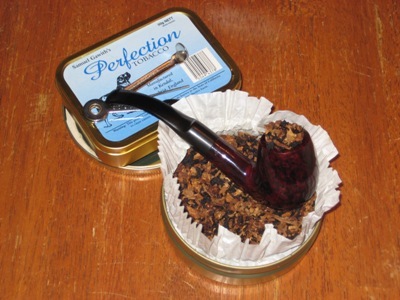 Pease tobaccos have become one of the better known premier pipe tobacco blends today. Greg makes it a habit of using only the best quality tobaccos that are available at any given time in his blends. G.L. Pease tobacco blends are made by hand and in small batches to maintain the integrity of his blends. 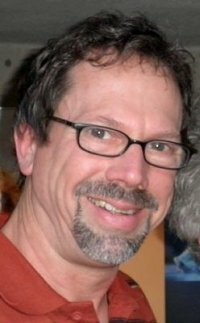 He also runs his own website [glpease.com] which is loaded with useful information about pipe tobacco and the G.L. Pease tobacco blends, all of which is written by Greg himself. You can see all of the G.L. 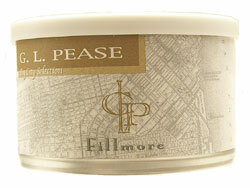 Pease tobacco blends with their descriptions at glpease.com and cornellanddiehl.com. PM: When you first started blending pipe tobacco blends, was it more of a hobby or did you have plans to make it into a business?